We like to believe that workers who are employed in offices or in administration work in ‘safe’ workplaces. However, these workers face a number of hazards – some of which have potentially very serious effects on their health and/or safety. Neck and back injuries from sustained ergonomic mismanagement often are life-long injuries and leave the injured person permanently in pain. When these injuries turn into workers compensation claims, they often become ‘major’ claims and result in increased premiums to the organisation. Office hazards are too often regarded as desk based or ergonomic! The tasks and expectations placed on administration workers regularly expose them to manual handling, hazardous substances, mental stress, and driving hazards. What is the minimum workspace specified in Model Work Health & Safety regulations and Codes of Practice? 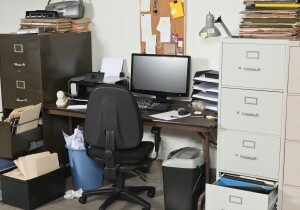 Is there a checklist for the selection of suitable office furniture and equipment? What type and frequency of rest breaks should I have? How do I reduce the risk of Occupational Overuse Syndrome (OOS) and what type of exercises can I do to prevent OOS? Can visual display units (VDU’s) affect my eyesight? Is the office environment (ie heating, cooling, noise and ventilation) comfortable? Do we have emergency preparedness and response plans?